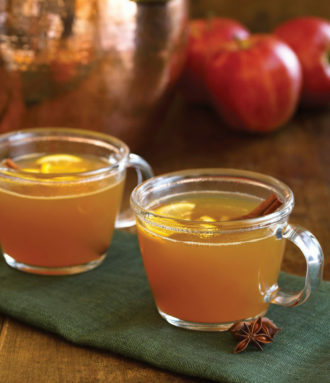 Cozy up to this steamy spicy mulled cider. Combine all ingredients in a saucepan and bring to a low simmer over medium heat. Lower the heat and continue to simmer gently for 30 minutes. Ladle into four mugs and serve hot. Reprinted with permission from Hot Drinks by Mary Lous Heiss and Robert J. Heiss. Published by Ten Speed Press.